Sitting in a private room of Council Oak Fish, Joseph Jingoli and Jack Morris had just a few minutes Thursday afternoon to relax. With the Boardwalk as a backdrop behind them, the quiet serenity of the room was a million miles away from the raucous energy inside the Hard Rock LIVE at Etess Arena a few hours earlier when the two were on stage smashing guitars with celebrities during the grand opening festivities of Hard Rock Hotel & Casino Atlantic City. 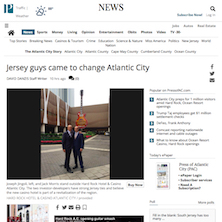 As part of the investment group behind the $500 million renovation of the former Trump Taj Mahal, Jingoli and Morris round out a powerhouse New Jersey quartet responsible for the casino hotel, which includes Hard Rock International Chairman Jim Allen and Hard Rock Atlantic City Property President Matt Harkness. Their direct ties to New Jersey are a major reason the two developers bet big on Atlantic City when all signs pointed toward the investment being folly.